I knew this was the perfect excuse to whip up a batch of these brownie cupcakes again! These stuffed brownie cupcakes are decadent and yummy and not so New Year's resolution-friendly. All in moderation is my motto. Make a batch- keep a few (or all!) or share with neighbors & co-workers. They will love you and curse you all at the same time. Preheat your oven to 350 degrees. Line 16 muffin pan cups with muffin liners. Set aside. In large bowl, mix together the brownie batter, water, eggs, canola oil, and Kahlua or coffee until well combined. Set aside. Make sandwiches using 2 Oreo cookies and about a tbsp of the cookie butter/pretzel mixture. Continue this until you have 16 Oreo cookie sandwiches. Drop a tbsp of brownie batter into each lined muffin cup. Then press in an Oreo/cookie butter/pretzel sandwich on top of the batter in each muffin cup. Cover the Oreo sandwiches with about 2 more tbsp of brownie batter. Bake at 350 for about 20-22 minutes or until the centers are set. Allow the cupcakes to cool in the pan for 10 minutes before transferring them to a wire rack to cool completely. **Adapted from THIS RECIPE from Picky Palate. 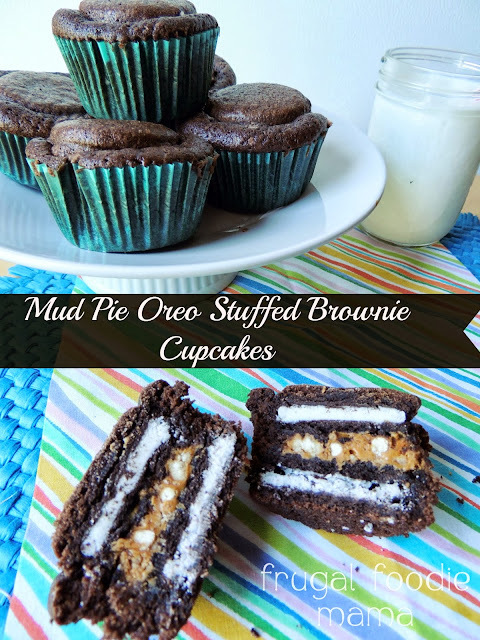 These Mud Pie Oreo Stuffed Brownie Cupcakes pair perfectly with a cold glass of milk... or a cup of coffee... or nothing.